Cando moves more than 13 million tonnes of potash a year in more than 125,000 railcars, handling 70 per cent of all potash produced in Canada. Most of it is for The Mosaic Company, the world’s largest supplier of potash and phosphate. Cando services three of Mosaic’s potash mines in Saskatchewan: Belle Plaine, Colonsay and Esterhazy. Cando was able to work with Mosaic and Canadian Pacific Railway (CP) to come up with solutions to complex challenges that allow Mosaic to move massive volumes of potash more efficiently by rail. Click here to download a printable PDF of this case study. After Mosaic awarded Cando the switching and mechanical services contract for their potash mines, the implementation process began in fall 2015. Cando started by establishing mechanical railcar services at the Belle Plaine and Colonsay mines, including car repair and cleaning. During this time, Cando worked closely with Mosaic and CP to develop operating plans for the switching services at Belle Plaine and facilitate the efficient movement of full loads and empty cars. The plans were finalized in early 2016, and they provided Cando operating authority between the mine site and CP’s Belle Plaine serving yard. Cando also worked collaboratively with Mosaic and CP to develop the switching operations for the Colonsay and Esterhazy mine sites. Planning the operations for Esterhazy’s two mine sites required coordinating shipping volumes through CP’s Bredenbury serving yard. CP gave Cando operating authority along their mainline subdivision between Esterhazy and Bredenbury, a distance of approximately 23 miles. Cando also provides track services at Potash Corporation of Saskatchewan’s Rocanville mine. 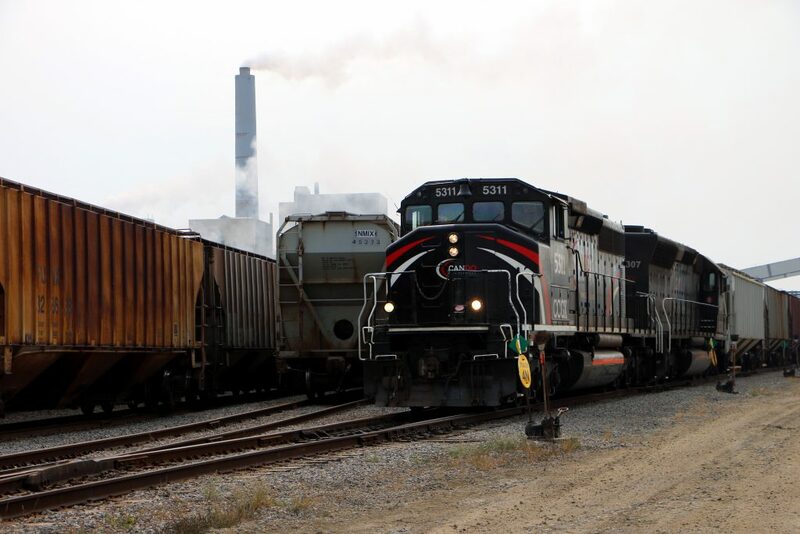 Running rights allow a rail services company like Cando to operate on CN or CP’s track, typically on a mainline subdivision or on industrial yard tracks, allowing operators to run trains directly to Class 1 serving yards. Cando Rail Services is the only service provider that has authority to run on CN and CP mainline subdivisions. What does “hook and haul” mean? Cando switches the loaded cars into the correct order and groups them according to their destination (“blocking”). Cando builds full trains and smaller blocks of cars depending on customer orders. The crews also perform a mandatory air brake test on each car and make sure the trains are ready for the Class 1 railway to come along and pull them away. All the work is done in advance by Cando, which allows the Class 1s to move the product to Mosaic’s customers faster and improve cycle times on the hopper cars. There are many factors that impact a transportation supply chain, including the communication and planning between the Class 1s and Cando. Nothing in the rail service industry works without these strong relationships. Cando would not be able to perform switching services for Mosaic without being granted operating authority from the Class 1 railways. Cando also depends on service from CP to hook and haul Mosaic’s trains to their customers and return the empty railcars. Thanks to longstanding relationships with CN and CP, Cando has hundreds of kilometers of running rights all over Canada and the U.S., including at Belle Plaine and Esterhazy in Saskatchewan. Cando also adheres to all the same strict standards as the Class 1 railways and has marked their place in the rail services industry through a commitment to safety and consistent service. “As we continue to build trust with Class 1s and customers, we also need to keep proving ourselves and standing by our quality in order to keep that trust,” says Chad Jones, General Manager of Industrial Services for Saskatchewan. Cando was able to save CP so much time in Esterhazy that the CP crews were able to reduce their yard time on through trains from three hours to one hour and 45 minutes, saving an average of 80 hours of train speed per month. Since Cando took over switching at all three Mosaic mine sites, the Class 1 rail yards are more fluid and less congested with cars waiting to be switched and the air brakes tested. CP also provided space in the Bredenbury serving yard for Cando to service Mosaic’s railcar fleet. Jason Ross oversees all three Mosaic mines in Saskatchewan and previously worked for CP for many years out of Moose Jaw. Ross says Cando consistently communicates to the Class 1s that they are present to help make things easier for everyone. Across all mines, Cando builds unit trains that are between 75 and 170 cars long for CP to hook and haul. At Mosaic’s Esterhazy mines, Cando also works with CN and builds up to 205 car export trains. The sustained collaboration among Cando, Mosaic, and CP reflects the close working relationships that are fundamental to Cando’s service. Each company benefits by gaining operational and cost-saving efficiencies and strengthening their focus on core business. For a customer like Mosaic, the key to moving more product by rail is the speed and flow of railcars in and out of the mine sites. Cando strives to create more fluidity at Mosaic’s sites in order to improve the whole operational cycle. Railcar supply can keep mines from loading. Potash cars often need to be cleaned, or have their bottom gates closed, before they are used again. As soon as the cars arrive back at the mine, Cando’s cleans the railcars on demand and performs light maintenance when required, helping Mosaic control costs. Having car maintenance done in-house eliminates the cost of transporting an empty railcar to another location for repairs, taking it out of the operational cycle for potentially up to a month or more. It also allows Mosaic to do preventative maintenance on their railcar fleet. At Esterhazy and Belle Plaine, switching crews are on hand 24/7 to service Mosaic. Ross says working with Mosaic on-site has allowed Cando to offer suggestions because they understand their operations and can spot opportunities for improvement. For example, Cando optimizes site track space with its expertise in yard organization and inventory management, coordinating not just the movements of empties and loads, but also the handling of inbound raw materials and crafting solutions for hot carloads to minimize dwell and keep all cars in active service. The first month (April 2016) Cando took over switching services at Mosaic’s Belle Plaine potash mine, Mosaic’s shipping and production group set a new daily record for tonnage shipped from the mine. While Cando can’t take all the credit for the sudden surge, consistent and well-planned service can make a huge difference toward leveraging Mosaic’s production capacity. Cando’s services help Mosaic control and maximize production, improve their fleet velocity, control costs on light repairs and cleaning for the railcars, and perform preventative maintenance — all in-house. Cando is the preferred rail service provider in the potash and fertilizer industry, with the rail expertise and safety knowledge to become part of the team at mine sites and work safely and efficiently.